Consider “Finding a Bible in an Abandoned Cabin,” a short, unassuming lyric near the middle of the book, in which the speaker simply tells of how he lifted the old leather cover and “the book / opened like a blasted bird,” how there were no more “familiar and miraculous inks,” only “a constructions of filaments and dust, / thoroughfares of worms, and a silage / of silverfish husks.” Though these lines can no doubt be read as a succinct critique of one of our deepest, most pernicious national obsessions, what I find so powerful about the poem is that it wrecks us and reconstructs us. The end takes us one step further: “in the autumn light, / eight hundred pages of perfect wordless lace.” In place of Paul’s fearful exhortations and those miracles that work against the natural world, Wrigley gives us the rot of silverfish, autumn light, and lace. He allows us, for a moment, to be in and of the world. and, for many years thereafter, understood nothing. 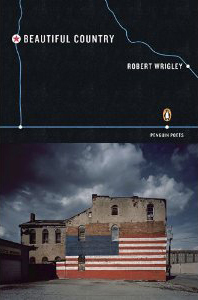 Almost all the poems in Beautiful Country are sharper, angrier, more culturally concerned than those of Wrigley’s last few books, yet readers will find Wrigley still grappling with many of his usual subjects: horses, mountains, starlight, the wind in the cedars. For this strange but effective admixture, Beautiful Country calls to mind two of Wrigley’s earlier masterworks: The Lives of the Animals, a book deeply rooted in the mountains of Idaho, and What My Father Believed, which chronicles Wrigley’s refusal to fight in the Vietnam War and his relationship with his father. Beautiful Country is also, simply, a great book by one of our great poets. Though I missed the man in the blue suit, I have already given Beautiful Country over to my wife. Someday, when he is wondering at this maddening, breathtaking country of ours, I will hand it to my son. This review originally appeared in the March/April 2011 issue of Orion magazine.